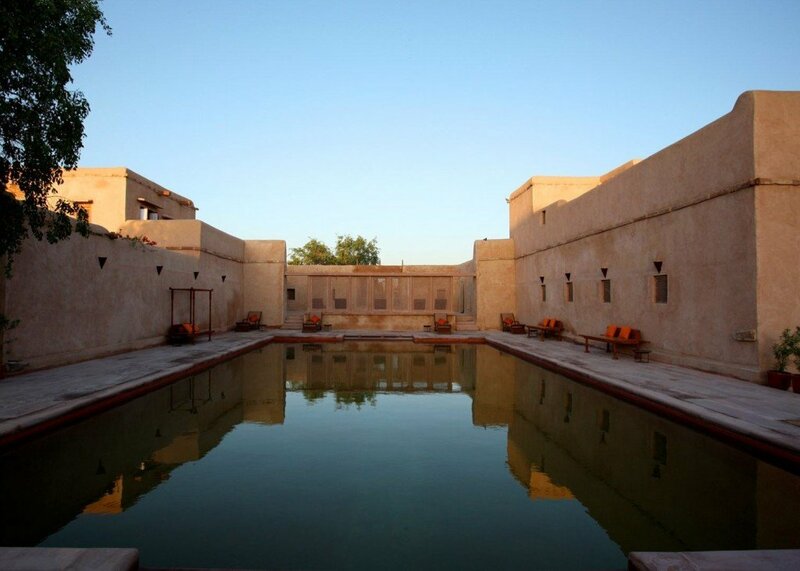 Ranvas is a spectacular boutique hotel recently opened in the little desert town of Nagaur, offering one of the most unique experiences in Rajasthan. 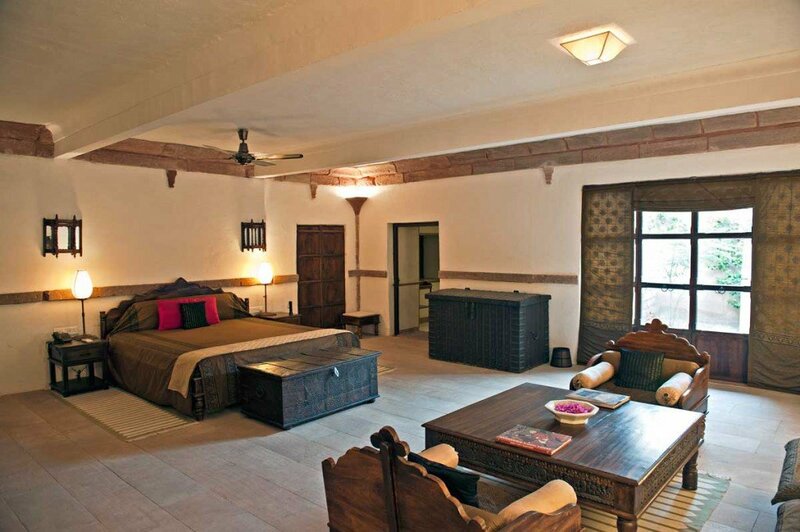 However, we’d be wrong to refer to it as new: this stylish property occupies the former zenana (women’s quarter) of Ahhichatragarh Fort, which dates back to the 12th century. 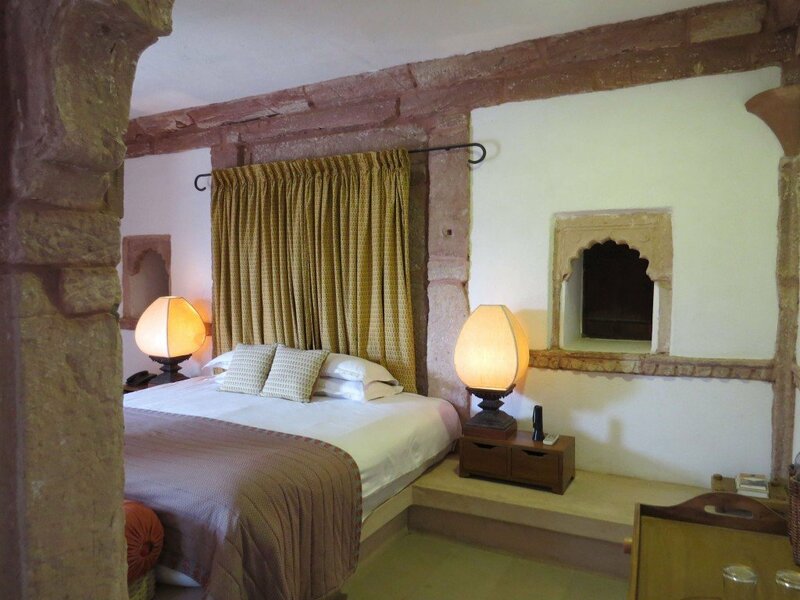 The rooms at Ranvas are all nestled within the fort itself, so one can experience a true glimpse into the history and romance of yesteryear, whilst enjoying the comforts of a luxury hotel. 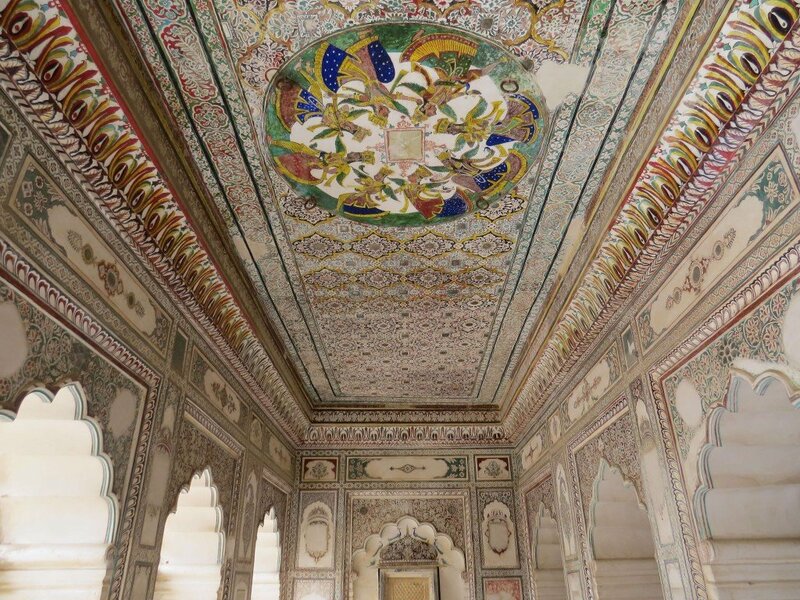 In the mid-18th century, the ruler of Jodhpur received the fort as a gift from the Mughals and embellished it with a charming pleasure palace. 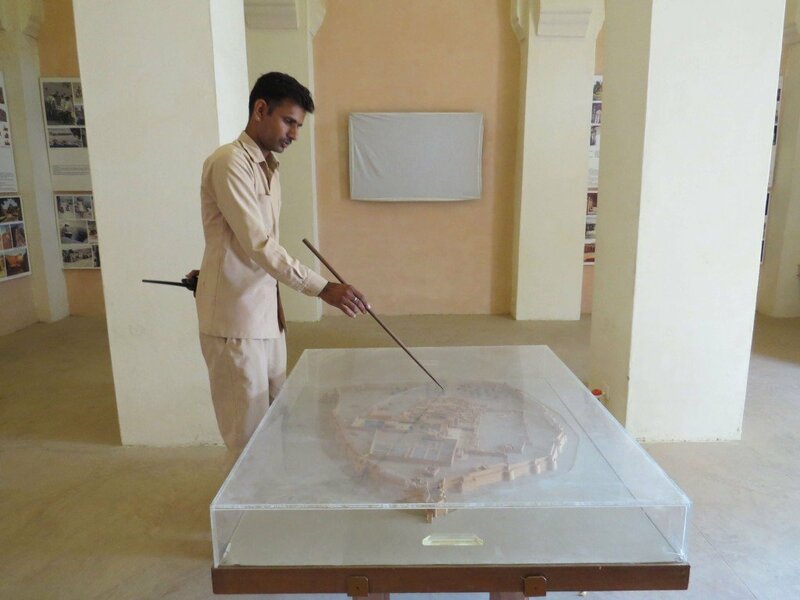 After years of neglect, the fort has been lovingly restored and the pain-staking renovation work continues to this day. After a relatively short drive from the Thar Desert, we arrived at Ranvas in the early evening. 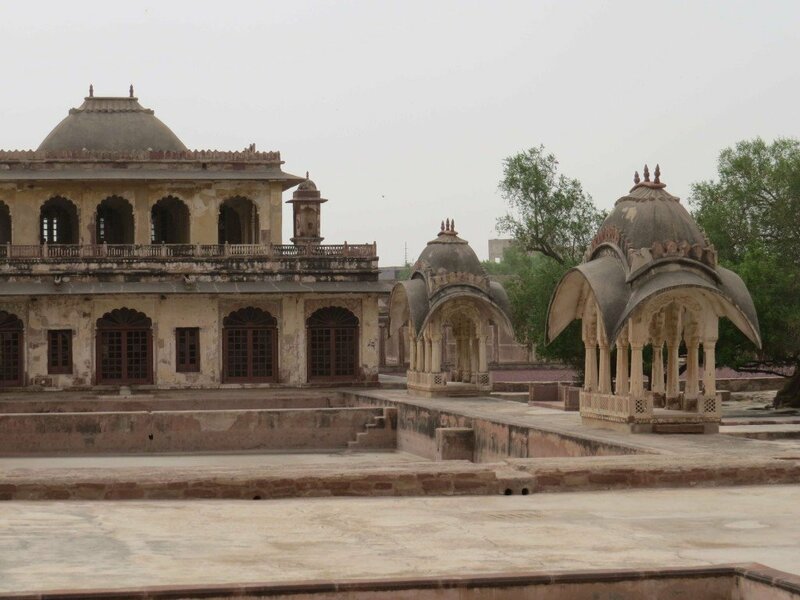 After navigating through increasingly narrow roads through the bustling town of Nagaur, passing through the fort’s grand arches felt as though we were entering an oasis of calm. 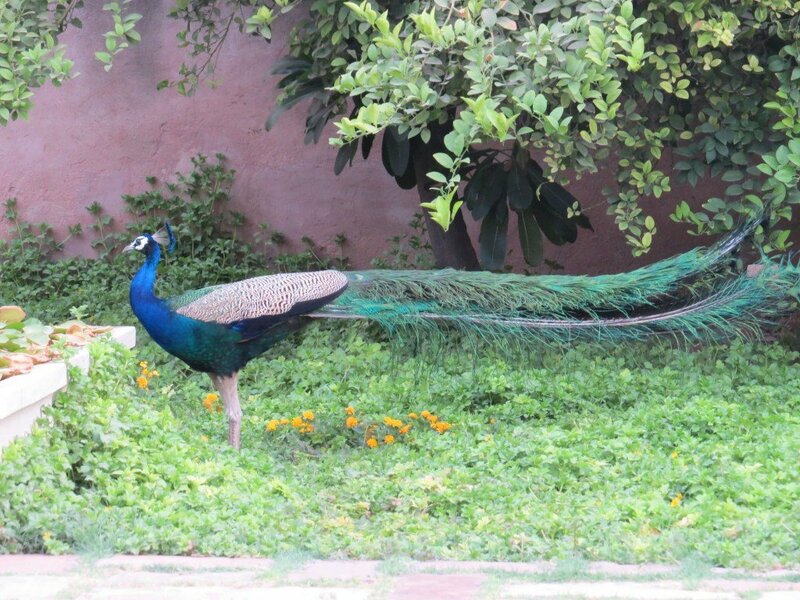 After being welcomed by the General Manager, we were ushered to our rooms whilst peacocks strutted casually around us. Walking through the building felt quite magical, really, and the property itself is enormous! There can be few places in the world where you can stay in virtually your own private fort, take an evening stroll along the ramparts past peacocks and pomegranate trees, and gaze down on the town’s busy streets and quiet desert countryside beyond. 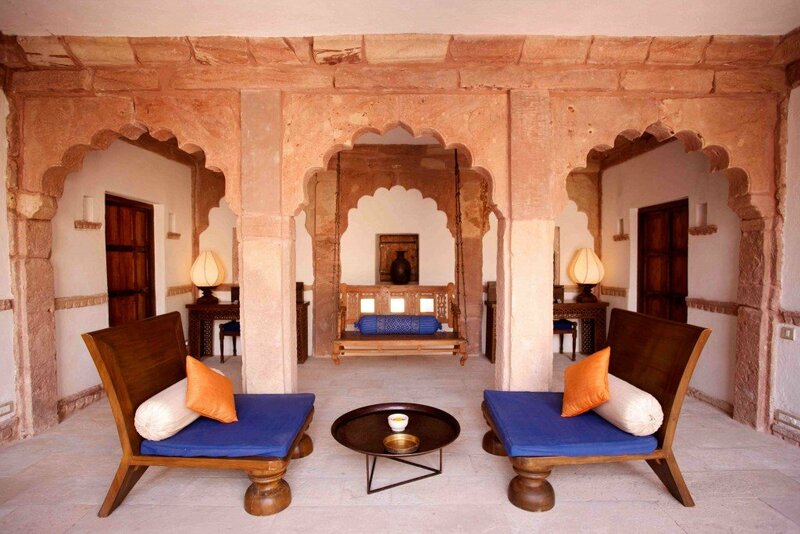 The hotel’s 27 rooms are spaced out amongst 10 individual havelis; each with two or three spacious guest rooms, a private courtyard, and stunning Rajasthani décor (the sandy exterior is wonderfully contrasted with delicate prints and bright pops of jewel-like colour in the furnishings). 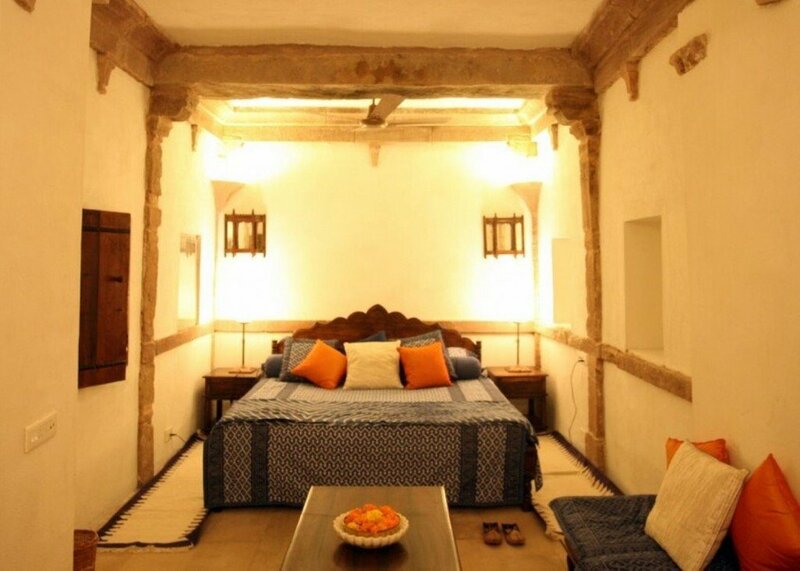 Perfect for couples and larger groups alike, as those travelling with family or friends can take over their own haveli! 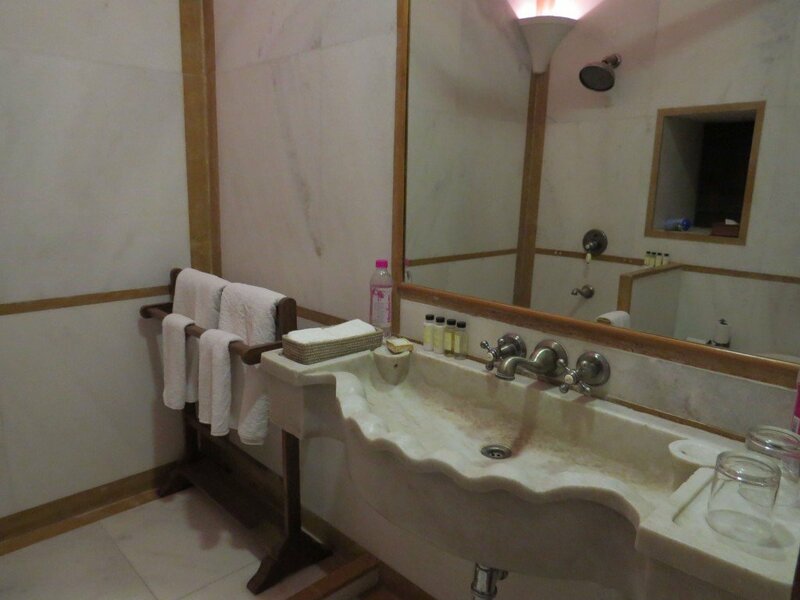 We both stayed in Deluxe King Rooms, which offer a comfortable bed, en-suite marble bathroom with rain shower, and a sitting area. To freshen up, we decided to have a dip in the pool, and what an amazing pool it was! As the sun began to set, we could hear bats rustling in the surrounding mango trees. A couple of the braver ones did swoop down over the pool (much to Shiv’s horror, but Maddie’s delight!). We then tucked in to a lovely dinner – an array of local Rajasthani dishes, from Bhindi Masala (spiced Okra) to Dal Tadka (tempered lentils). 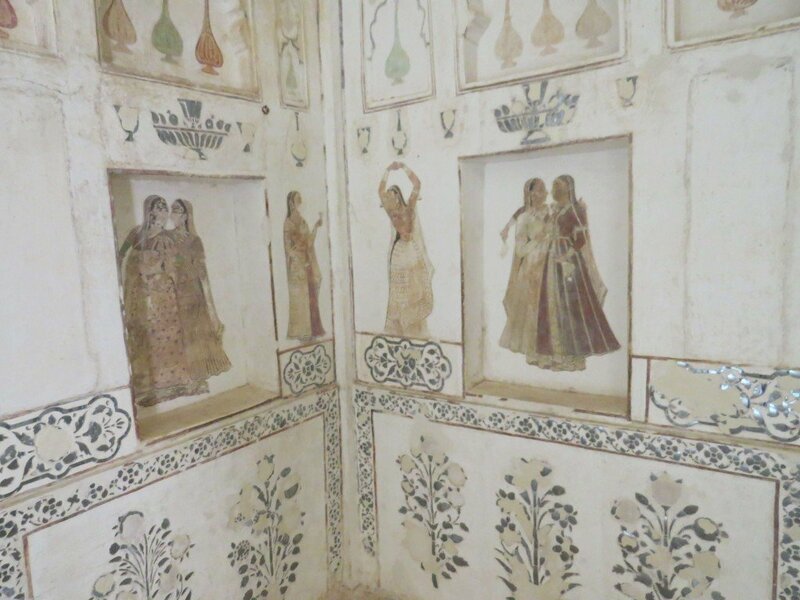 There are two restaurants at Ranvas, though for a romantic experience we’d recommend dining privately in one of the palace’s courtyards, surrounded by glowing oil lamps. 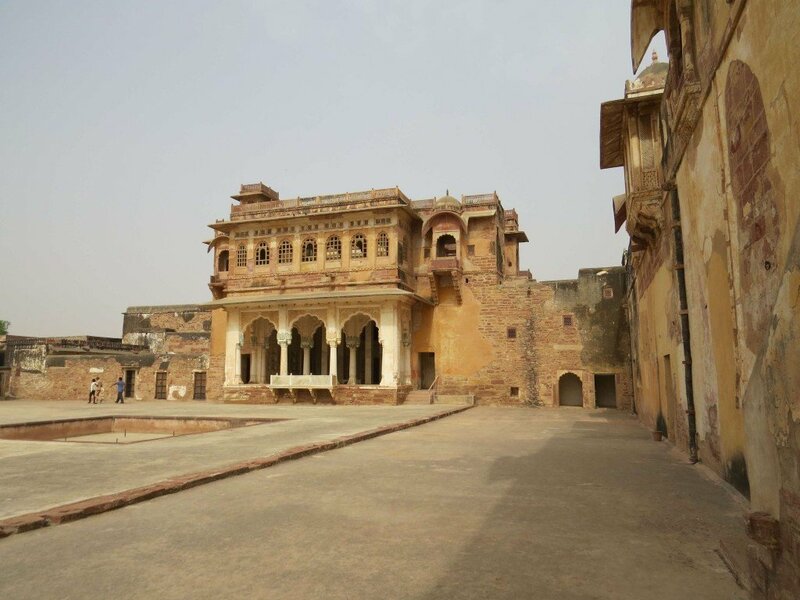 The following morning, we explored the fort with the hotel’s friendly guide. 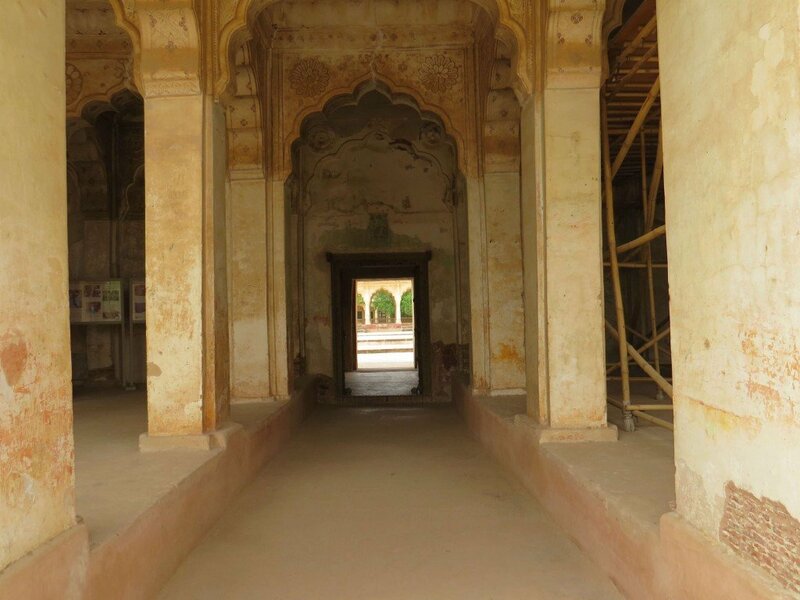 In contrast to the forts in Jaipur, Jodhpur and Udaipur, the interesting thing about this one is that it’s still being renovated even today. 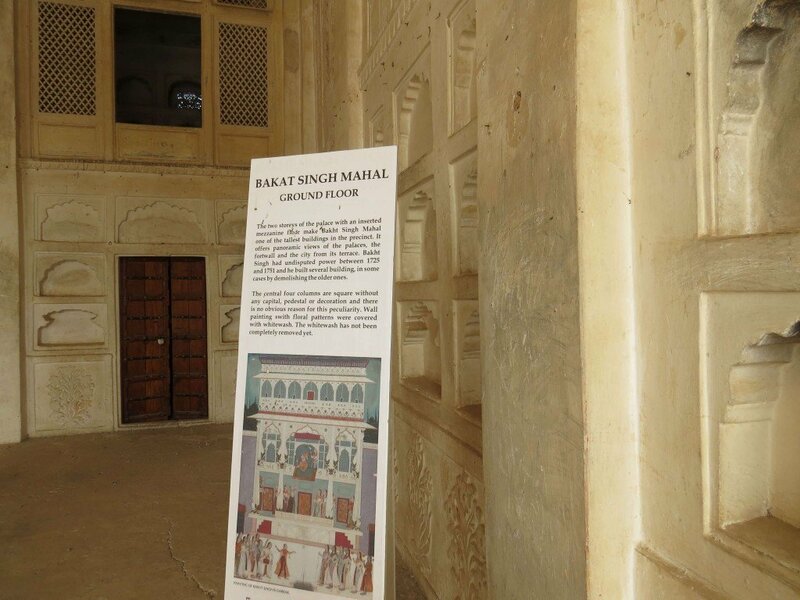 Our tour of the fort explained what they’ve done so far to restore it to its present state, and the methods they used – we found it fascinating. 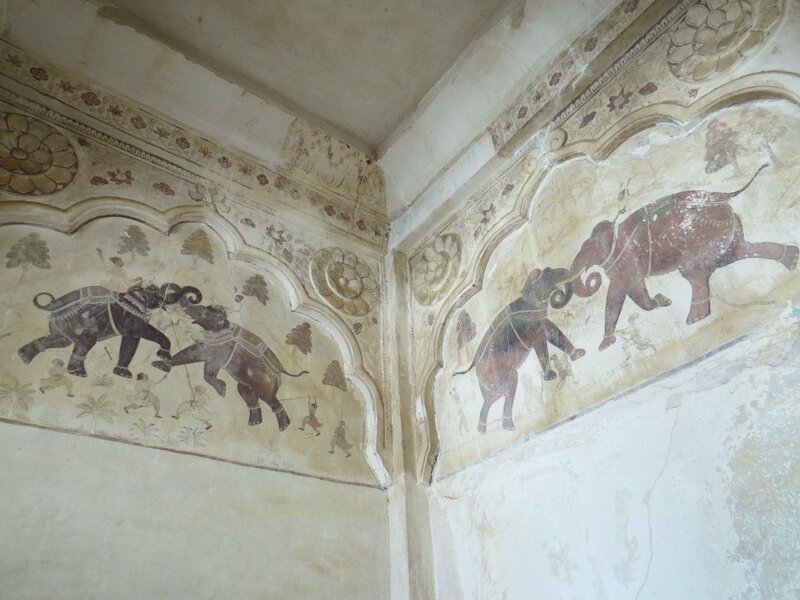 Many of the beautiful wall paintings were whitewashed by the government when they used this fort as an army base – today, they’re carefully bringing them back to their original glory. 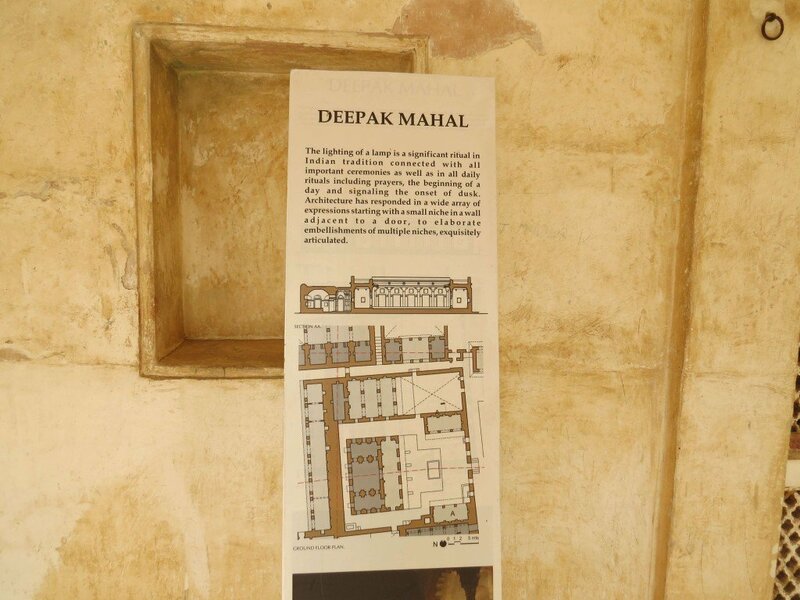 A highlight for Maddie was the Deepak Mahal, which used to house a myriad of deepaks (oil lamps). Today, Ranvas can arrange a very special private dining experience here under the stars, surrounded by hundreds of flickering flames; an impossibly romantic experience. 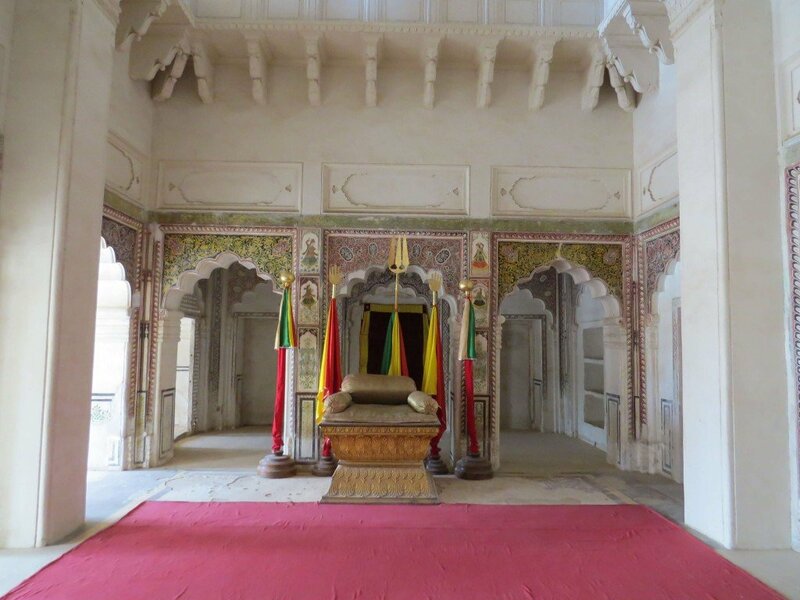 Next door to the Deepak Mahal lies the bedroom of Emperor Akbar the Great (1556 – 1605). 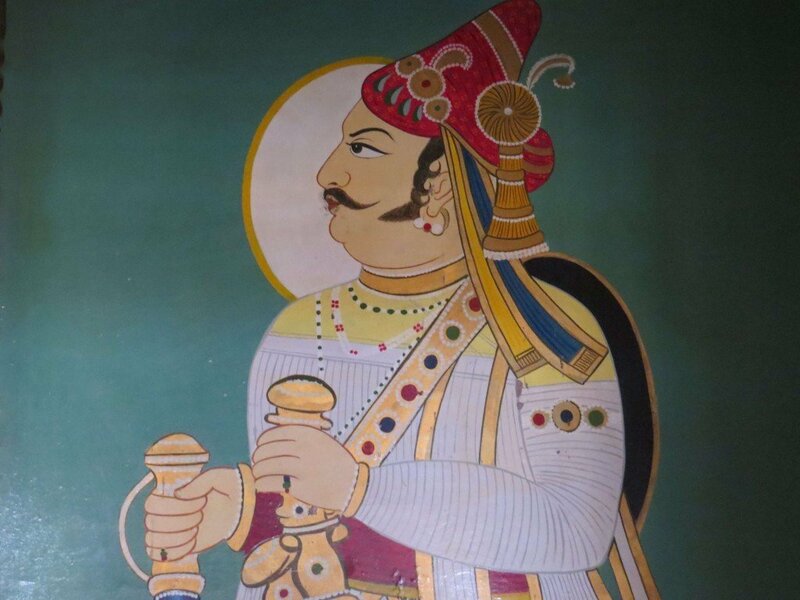 This is the same ruler who built Fatehpur Sikri on the outskirts of Agra. 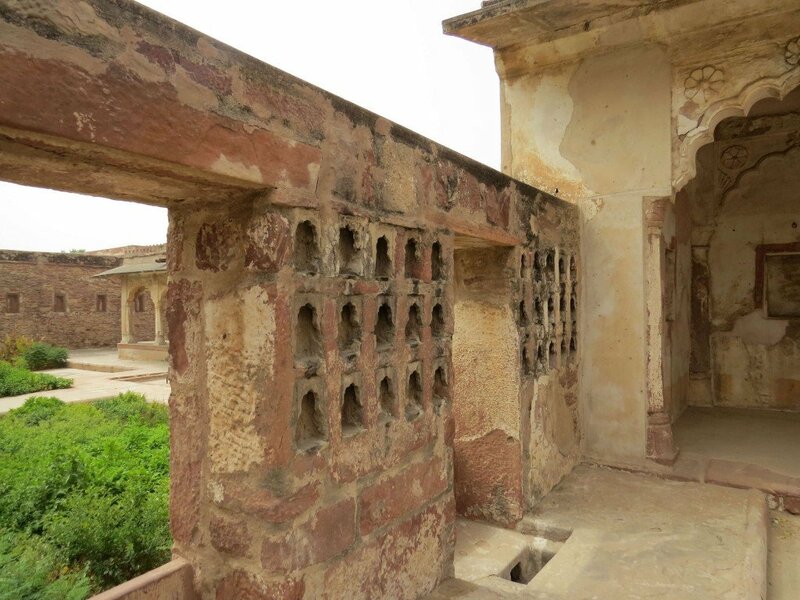 Another impressive part of the fort is the intricate water system. 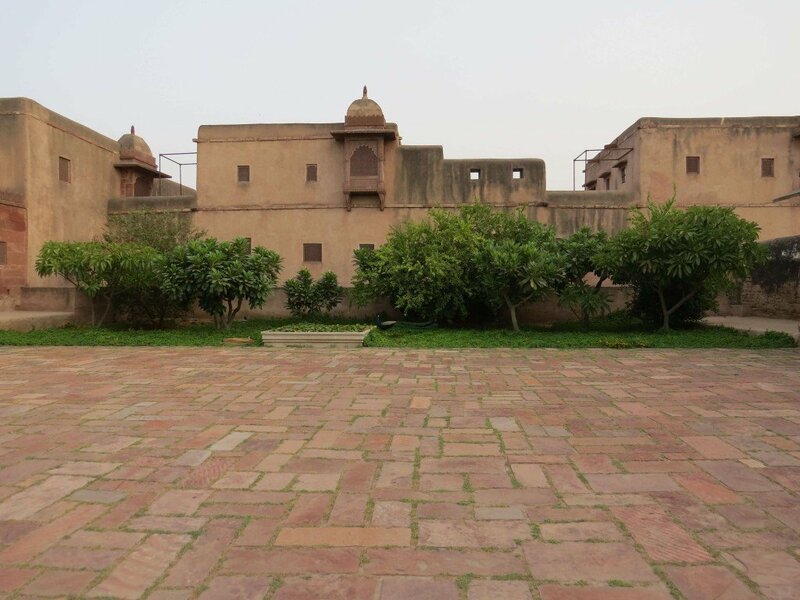 Channels on the roof act as a water harvesting system, which then run through the property during the hotter months to ensure the royals are cool and comfortable. 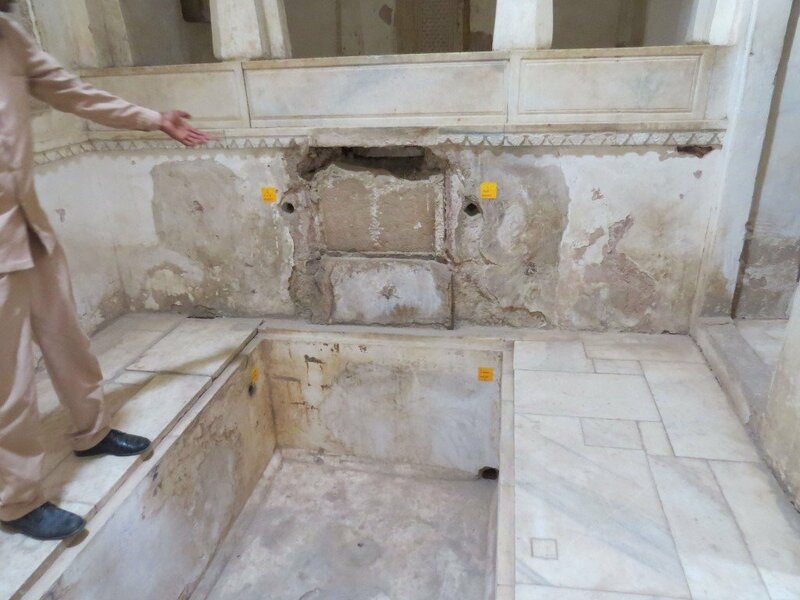 An incredible form of ancient air-conditioner, really! Whilst we toured the fort, we were kept in chilled water and cool hand towels instead. We then had breakfast in the restaurant and, like dinner the previous evening, it was a lavish affair! From fresh fruit to toast to omelettes to parantha (Indian flatbread), Ranvas have a dish to suit all palettes. Before leaving Ranvas, we were invited for a tour of the property by the General Manager (at Indian Excursions we value a rich knowledge of the region, it’s hotels and its sights, so are always keen to get a first-hand look at an entire property so we can select the very best room for your tastes and requirements). The rooms are divided into Deluxe Queen Rooms (7), Deluxe King Rooms (10) and Royal Suites (10). Though all were beautifully charming, we both agreed that the Deluxe King was our favourite. For a family however we’d recommend the Royal Suite as it’s the most spacious and can comfortably accommodate an extra bed. The Deluxe King’s are stunningly designed and, we feel, had the most interesting décor. We found the Deluxe Queen to be a little small for a couple, though would be ideal for an individual. 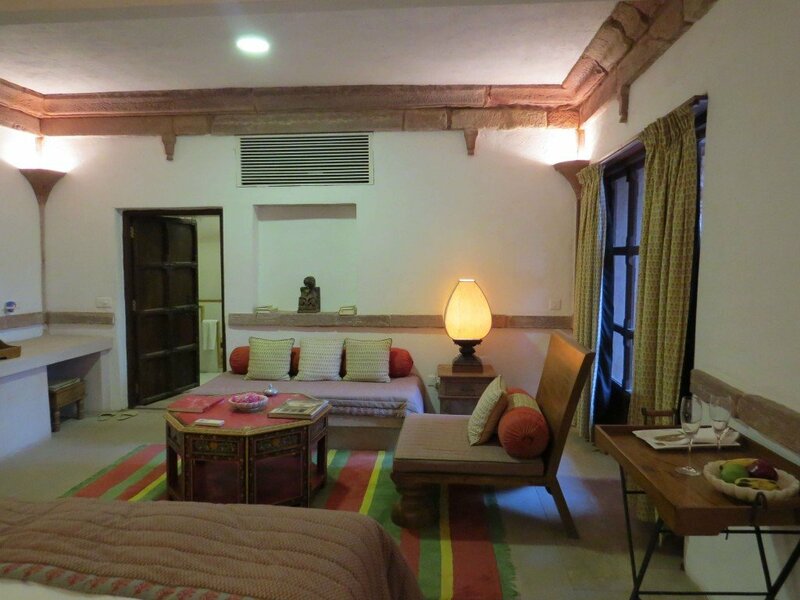 Overall, we thoroughly enjoyed our stay at Ranvas, as have many of our past guests. It’s an incredible place offering a unique experience in one of the region’s lesser frequented areas. 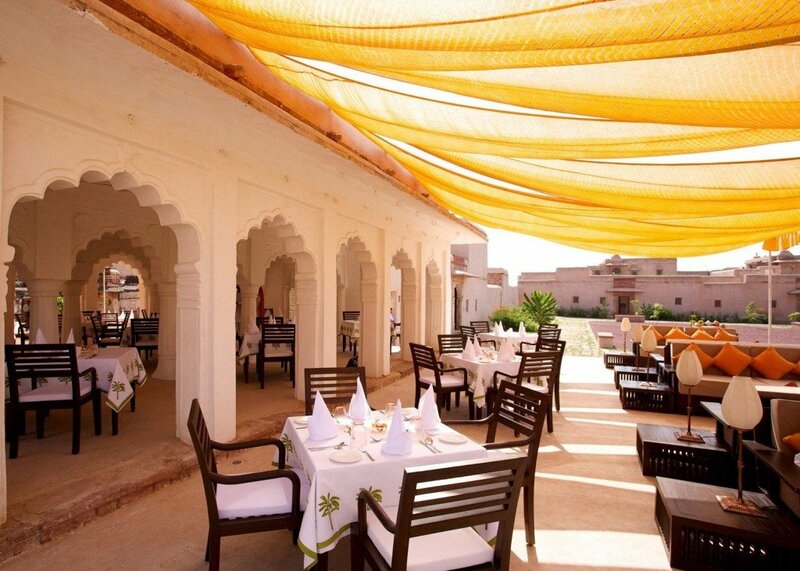 Conveniently located within driving distance of Jaisalmer, Bikaner, Jodhpur or Jaipur, it’s also a wise stop-over for those who’d like to break down the longer drives into more manageable chunks. 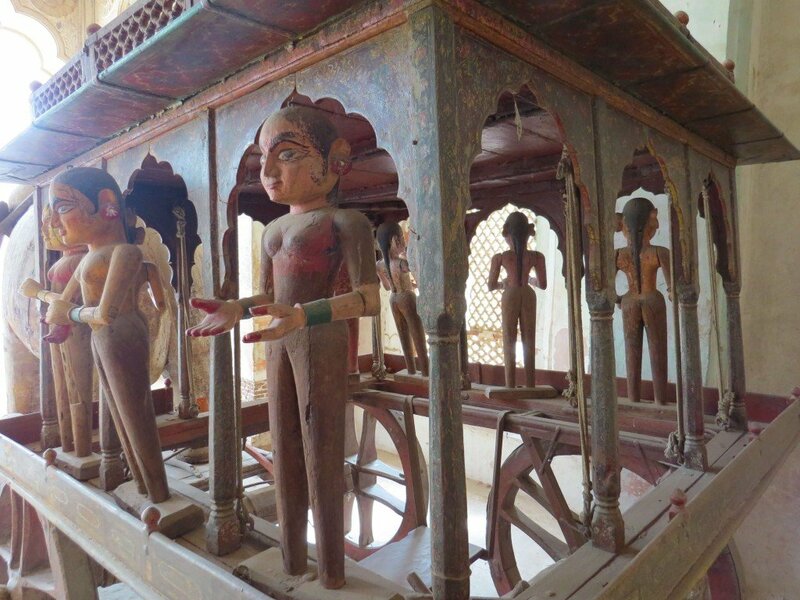 If you’d like to include Ranvas in your upcoming Rajasthan tour, please do take a look at our Rajasthan with Boutique Hotels and Essence of Rajasthan sample itineraries, or get in touch to share your ideas so far. We’d love to assist with the planning of your tailor-made holiday and brings your ideas to life.